Unmanned Aerial Vehicles (UAV) have sparked controversy as they usher in a new age of remote-controlled combat, but all of the service branches are using them. As you'd expect from their name, of course, the Air Force has done no differently. 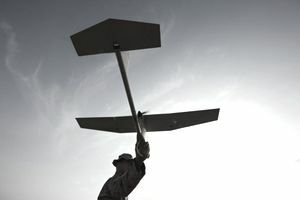 Yet unlike their counterparts, the Air Force brass may be falling behind the power curve by limiting just who can fly UAVs - and that means, depending on your education level and career ambitions, you may be taking your business to another recruiter. Although at face value flying a UAV seems remarkably similar to playing a video game, the consequences of every pilot's actions are deadly serious. Unmanned planes are at the forefront of gathering aerial intelligence around the globe, so in addition to being a skilled operator, the pilot must be able to analyze intelligence imagery in order to make snap decisions about when to pursue a lead or get out of dodge. Of course, UAVs like the Predator can also be equipped with Hellfire missiles - meaning each UAV pilot must have the mettle to decide if and when to pull the trigger on someone half a globe away. Unlike its sister services, who have all decided the best way to deal with demands for UAV pilots is to make it an enlisted career field, the Air Force currently insists on holding out for commissioned officers only. That means to fly a UAV in the Air Force, you'll need a college degree, though not necessarily a pilot's license. According to Brigadier General Lyn D. Sherlock, enlisted careers in UAVs are off the table for the moment "because battlefields are complex, joint environments that involve other aircraft and communicating with soldiers and airmen on the ground." Seems like plenty of enlisted aircrews already deal with that complexity, but so be it. Because Air Force UAV flyers must be commissioned officers, a trip through one of the officer training pipelines – such as four years in the Air Force Academy, or a few months at the Officer Training School (OTS) for those who already have a degree - is the first step. Afterward, training depends on how you make your way into the UAV field. According to Air Force Magazine, the Air Force's plans back in 2009 to start training exclusive UAV pilots involved "a four-week fundamentals course ... at Randolph AFB, Tex., before moving to Creech AFB, Nev., for more instruction." Otherwise, military author James Dunnigan, in a 2012 piece for StrategyPage.com, claimed that "the UAV operator force is still dominated by TDY [temporary duty] pilots" who have already undergone extensive training in traditional cockpits. If your heart is set on working with UAVs, the Air Force (ironically) may not be the best choice at the moment. If Dunnigan's assertion is correct - that "[d]espite . . . becom[ing] more popular within the air force, the training program cannot keep up" - then opportunities to head straight into UAVs after officer training may still be very limited. And for those who join the Air Force specifically to sit in the cockpit, Air Force Times points out there may still be a "stigma that many associates with flying UAVs" - a community viewed by some, in the words of then-Air Force Chief of Staff General Norton Schwartz, as "a leper colony or an agency of expedience." Add to that the exclusion of enlisted airmen from the career and those of you coming right out of high school looking to get into the UAV field may be tempted to head over to the Army, Navy, or Marine recruiters, with good reason. But the Air Force may not lag behind forever. Back in 2009, Air Force Magazine pointed out that plans projected sending "roughly 100 brand-new pilots" directly to the UAV pipeline annually, and even when the new UAV career field for officers was announced in 2008, the Air Force admitted that "enlisted flyers have yet to be ruled out."